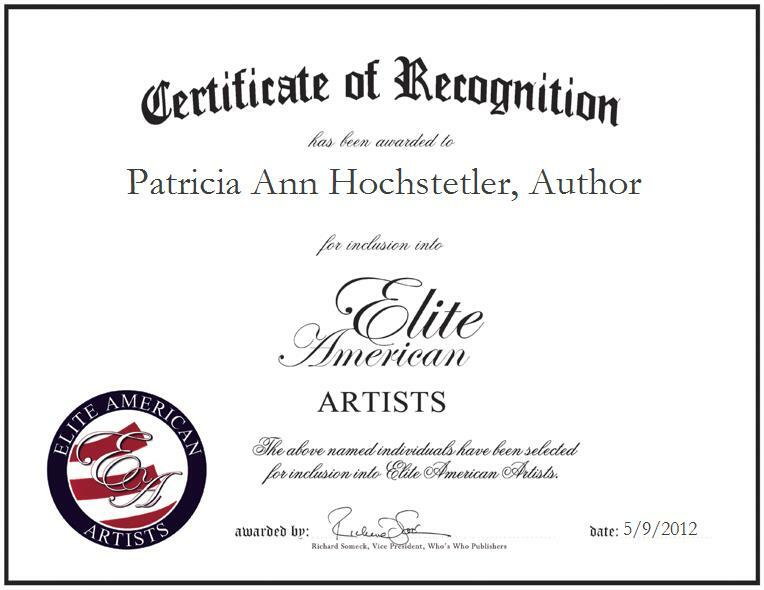 GOSHEN, IN, May 9, 2012, Patricia Ann Hochstetler, Author and Freelance Writer for Patricia’s Books, has been recognized by Elite American Artists for dedication, achievements, and leadership in authorship. Ms. Hochstetler, an author and freelance writer, demonstrates profound talents as a remarkably skilled writer and illustrator, and she currently allows her expertise to shine through by composing poetry, a trilogy in fiction, and children’s books. With more than 16 years of professional experience under her belt, Ms. Hochstetler pinpoints the most gratifying aspect of her writing career as her being able to raise her children and write professionally, as she is proud to share her love of writing in her pieces. Ever passionate about her work, Ms. Hochstetler remains abreast of trends and developments in journalism as a member of the Bethel College Writer’s Club, and the Society of Children’s Book Writers and Illustrators. She also supports a number of worthy causes in her spare time; Ms. Hochstetler volunteered for the victims of Katrina and Rita hurricanes in efforts to help individuals and families recover from the devastation. She has also written the Sunrise Series of Poetry. Ms. Hochstetler has a pigeon farm with 14 coups with 200 bald-headed roller pigeons. She brought this breed of pigeon back from extinction. Ms. Hochstetler is also a real estate investor with several properties.